Considering im a foundation hoarder, mineral foundations are something im not familiar with. I don't know why but mineral foundations just havent appealed to me. 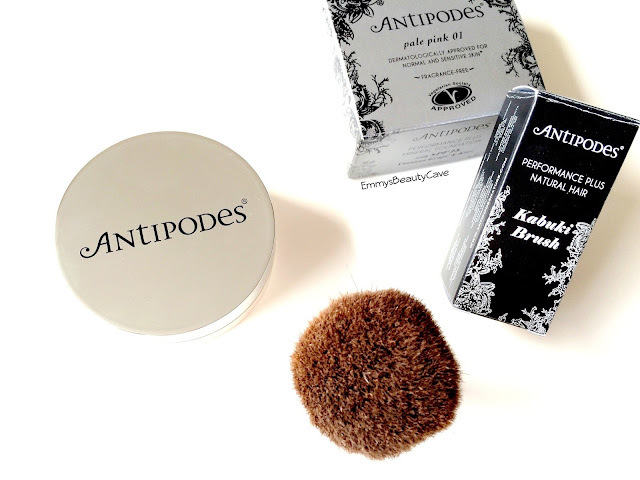 I recently tried Antipodes Skincare which i loved One of the main reasons i loved it is because it is natural ingridients and good for your skin. I wear makeup pretty much everyday so it can take its toll on my skin. Anything that claims to be good for my skin i am willing to try. 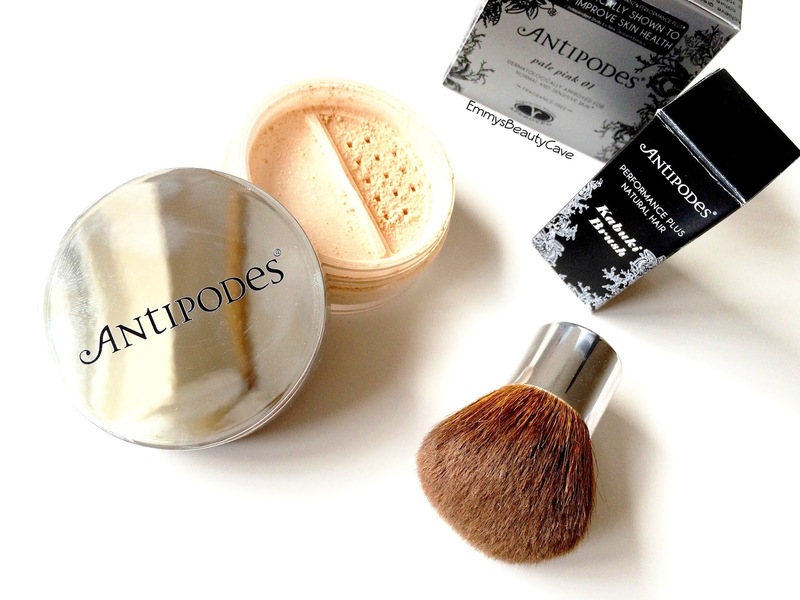 I also got sent the Antipodes Kabuki Brush to apply the Mineral Foundation with. I am so glad i received this brush as i wasn't sure what would be best to apply it with. I chose the shade Pale Pink which is a perfect match for my skin tone and im a NW20 in MAC or a NW25 when tanned. The packaging is simple, easy to get product out. I dabbed the brush into the powder and started in the center of my face working outwards. I applied this in circular motions rather than sweeping. After the first layer i was quite surprised and impressed with the coverage it had provided. My complexion looked flawless yet natural. I decided to apply a second layer to see if this would be buildable. It definitely can be built up but not to full coverage. I found it gave medium coverage whilst looking natural and not heavy at all. The only thing i found with this foundation is that you really need to moisturise and use a primer. Because it is powder based it is alot drier than your typical liquid foundation. Antipodes do state that this foundation suits all skin types from Normal to Dry to Oily. After a few hours my t zone was still matte not one sign of any shine in sight! I usually have to re apply powder in the afternoon but i didn't need to. Overall i am pleasantly surprised at how much i love this foundation. Antipodes have now converted me to mineral foundations. If you have always wondered about mineral foundations but like me never tried them you should definitely give them a try. The Antipodes Mineral Foundation and Kabuki Brush can be purchased from Feel Unique (currently on offer). Have you tried a mineral foundation before? I really want to try out some mineral foundations now!